Size: 638 sq.ft. - 1379 sq.ft. Mudon Views project was launched in March 2017 by Dubai Properties in Mudon Township. 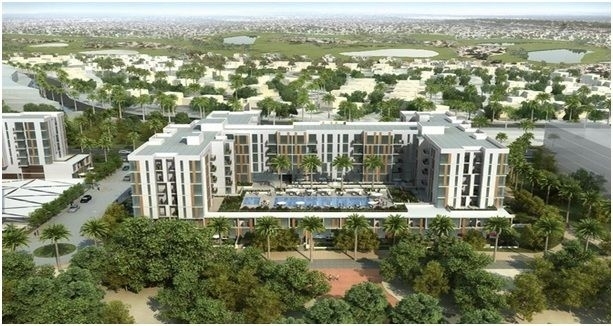 Mudon Views is a residential complex having 1 to 3 BR park front apartments. Currently the Mudon Views is the only It is a mega infrastructure by Dubai Properties at the exciting new destination of Dubai – "Dubailand". The apartments of Mudon Views give direct view of the 41-acres lush green Mudon Central Park while the other outdoor spaces of Mudon Views is designed with Cycling, Jogging or Walking trails. Mudon Views is set to be completed on second quarter of 2020 and at an affordable price. Mudon Views project is part of 64000 Square Feet sprawled community at Dubailand. Mudon is residential apartment community hosting Retail Outlets, Playground, Mosque, Restaurants and Supermarket within.The Mudon Central Park is almost completed while the GEMS school is currently in the final stages of development. The Mudon View project work consists of a 7 storey apartments. It is a Ground floor+6floor with 3 level of parking in each tower for residents. The project is a greatest attraction as having thoughtfully executed homes to cater requirements of residents with the beautiful outdoor spaces. Mudon Properties sizes ranging from 1 BR apartments 638 Sqft, 2 BR homes from 915 - 1,198 Sqft and 3 BR ranging from 1,373 - 1,379 Sqft. Units of 1 Bed starts from AED 766000 while 2 Bed units starts from AED 1,049,000 and 3 Bed at AED 1,879,000. Dubai Properties is Dubai based Construction Company was established in 2004. The group has stated – "Over the coming time the city will see more Residential towers, Commercial developments, Waterfront homes and floating homes as part of the company's transformation of the bustling commercial hub of Business Bay, Dubailand and many more locations of Dubai". The company holds more than 15 years of experience in the real estate market. The success story of Dubai Properties began in 2002 when it commenced operations as "Estithmaar Realty". Dubai Properties has so far delivered 40,000 residential units, and there are more than 100,000 people living in our communities, happy and safe. Mudon Views project is situated in Dubailand. Dubailand is the exciting new destination in Dubai featuring shopping, sporting and entertainment facilities. Dubailand will house 45 mega developments and over 200 leisure, tourism and entertainment Mudon community residents enjoy a peaceful lifestyle& surrounding while being few minutes away from the city’s crowd off Al Qudra Road i.e. opposite to Arabian Ranches. Mudon Views is at prime location because it is in proximity to Dubai's iconic landmarks: Academic City (3 minutes), Mall of Emirates (15 minutes), Outlet Mall (6 minutes), DIFC(7 minutes), Global Village Global Village), Emirates Towers (8 minutes), Dubai International Airport (9 minutes), Dubai Mall (17 minutes), Dubai International Financial Centre (7 minutes), etc.Mudon residential community is also accessible from Emirates Road, Mohammed Bin Zayed Road andnear to Motor City, Dubai Cycling Course and Sports City. Mudon Views apartments are being established in Mudon Community, Dubailand, UAE. The facilities of Mudon Views covers 24 Hours Security,Jogging Tracks Business Centre, Children's Play Area, Community Centre, Easy Access to Transportation, Games Room, High-quality Fixtures, Iconic Views, Football Field,Landscaped Gardens, Swimming Pool, Modern Community Centres, Modern Interiors, Private & Guest Parking, Retail Facilities and many more.